A self-appointed neighborhood watchman who pursued and then shot dead an unarmed 17-year-old boy outside his stepmother's home last month in Sanford, Fla., reportedly wanted to be a police officer and had called 9-1-1 50 times in the last year. Trayvon Martin, a black high-school junior, was making his way home with a bag of Skittles and a can of iced tea on Feb. 26 when George Zimmerman spotted him, called a non-emergency dispatch number to report Martin looked intoxicated, followed him, and then minutes later after an altercation, shot him. Zimmerman, 28, who is white, claimed self defense. He was never arrested and has been charged with no crime, sparking national outrage. ABC News has learned police seemed to accept Zimmerman's account at face value that night and that he was not tested for drugs or alcohol on the night of the shooting, even though it is standard procedure in most homicide investigations. The night of Feb. 26, Zimmerman made a non-emergency call to police before fatally shooting Martin, in which he told a dispatcher, "This guy looks like he's up to no good, on drugs or something." But law enforcement expert Rod Wheeler who listened to the tapes tells ABC News that Zimmerman, not Martin, sounded intoxicated in the police recordings of the 911 calls. "When I listened to the 911 tape the first thing that came to my mind is this guy sounds intoxicated. Notice how he's slurring his words. We as trained law enforcement officers, we know how to listen for that right away and I think that's going to be an important element of this entire investigation," Wheeler said. But Zimmerman was not tested. Martin's family is now calling on the FBI to take over what they say is a botched investigation. "We've got a fair investigation, it was the best we can do, it's in states attorney hands now," Sanford Police Department spokesman Dave Morgenstern said. The series of calls to police, which depict the apparent progression of events that led to Zimmerman allegedly shooting Martin, sent the boy's mother screaming from the room and prompted his father to declare, "He killed my son," according to a family representative. The contents of the calls and the family's reaction to them were recounted to ABC News by a representative of the boy's family, Ryan Julison, and ABC News affiliate WFTV published excerpts from the 911 calls. On one call to a non-emergency dispatch number, according to Julison, Zimmerman says, "He's checking me out," and then, "This guy looks like he's on drugs, he's definitely messed up." "These a**holes always get away," he adds. The dispatcher is heard trying to discourage Zimmerman, asking, "Are you following him?.. Okay, we don't need you to do that." Within minutes, however, 911 calls are being made to police reporting the two are fighting. "They're wrestling right in the back of my porch," one frantic caller says. "The guy's yelling help and I'm not going out." On a second call someone's screams for help can be heard and what sounds like two gunshots. The caller's boyfriend shouts, "Get down," and after the second apparent gunshot, the shouts for help cease, Julison told ABC News. "There's gun shots. Uh, I'm pretty sure the guy is dead out here, holy sh**," a caller says into the phone. One witness describes Zimmerman after the shooting. "He's out there with a flashlight. The guy is raising his hands up saying he shot the person," the caller said. Martin's family listened to eight tapes, Julison said. At one point, Sybrina Fulton, Trayvon's mother, ran out of the room screaming and crying, barely lasting through half the tapes. The boy's father, Tracey Martin, stoic and measured until then, erupted, Julison said. "He killed my son," Martin said, according to Julison. "He killed my son. He couldn't control himself." The Sanford, Fla., Police Department, relenting to massive public pressure, plans to release parts of the 911 tapes pertaining to the shooting, multiple sources told ABC News, but wanted the boy's family to hear the tapes before they were released to the public, according to a family source. A week after ABC News uncovered questionable police conduct in the investigation of the fatal shooting, including the alleged "correction" of at least one eyewitness' account, outrage that the shooter remains free is intensifying. "It's surprising. It's shocking," said Tracy Martin, Trayvon's father. "It lets me know that justice is just not being served here. All we want is justice for our son. We're not asking for anything out of the ordinary." In an interview with ABC News, Martin's mother, Fulton, tearfully said she only seeks an arrest. "Let a judge and jury decide the rest," she added. In the meantime, outrage is spreading across the Internet. The Seminole County State Attorney's Office was so bombarded by emails demanding that it prosecute Zimmerman that its website had to be taken down for 45 minutes, according to a spokeswoman for the office. One of several petitions for Zimmerman's arrest has garnered more than 250,000 signatures on a change.org site, and at one point signatures were pouring in at the rate of 10,000 an hour, according to the website. The outrage has been partly buoyed by calls for non-violent action by hip-hop luminaries, including Russell Simmons, who has been tweeting about the tragedy and warning against its possible vigilante violence. "Trayvon Martin didn't die so we can create a race war he died so we can promote better understanding. We must start honest dialogue," Simmons wrote. It may have been an allusion to a statement by a group called the New Black Liberation Militia, which planned to travel to Sanford, Fla., next week to enact a citizen's arrest against Zimmerman and bring him to federal authorities. Sanford, Fla., Police Chief Billy Lee said Zimmerman asserts he shot Martin out of self-defense. "Until we can establish probable cause to dispute that, we don't have the grounds to arrest him," Lee said last Tuesday. Martin had been staying at his father's girlfriend's house and stepped out. On his way back into the gated suburban Orlando community, Martin was spotted by Zimmerman. Zimmerman described Martin as suspicious because he was wearing a hooded sweatshirt and walking slowly in the rain, police later told residents at a town hall. A dispatcher told him to wait for a police cruiser, and not leave his vehicle. But about a minute later, Zimmerman left his car wearing a red sweatshirt and pursued Martin on foot between two rows of townhouses, about 70 yards from where the teen was going. Zimmerman's pursuit of Martin did not of itself constitute a crime, Lee said. Witnesses told ABC News a fistfight broke out and, at one point, Zimmerman, who outweighed Martin by more than 100 pounds, was on the ground and that Martin was on top. Austin Brown, 13, was walking his dog during the time of the altercation and saw both men on the ground but separated. Brown, along with several other residents, heard someone cry for help, just before hearing a gunshot. Police arrived 60 seconds later and the teen was quickly pronounced dead. According to the police report, Zimmerman, who was armed with a handgun, was found bleeding from the nose and the back of the head, standing over Martin, who was unresponsive after being shot. An officer at the scene overheard Zimmerman saying, "I was yelling for someone to help me but no one would help me," the report said. Witnesses told ABC News they heard Zimmerman pronounce, "It was self-defense," and place the gun on the ground. But after the shooting, a source inside the police department told ABC News that a narcotics detective and not a homicide detective first approached Zimmerman. The detective peppered Zimmerman with questions, the source said, rather than allow Zimmerman to tell his story. Questions can lead a witness, the source said. Another officer corrected a witness after she told him that she heard the teen cry for help. The officer told the witness, a long-time teacher, that it was Zimmerman who cried for help, the witness told ABC News. Lee publically admitted that officers accepted Zimmerman's word at the scene that he had no police record. Two days after the incident, during a meeting with the victim's father, Tracy Martin, an officer told the father that Zimmerman's record was "squeaky clean." Yet public records showed that Zimmerman was charged with battery against on officer and resisting arrest in 2005, a charge that was later expunged. In a letter to the Orlando Sentinel, Zimmerman's father contended his son is not a racist. "At no time did George follow or confront Mr. Martin. When the true details of the event became public, and I hope that will be soon," the letter said, "everyone should be outraged by the treatment of George Zimmerman in the media." "I asked [the police], 'Well, did you check out my son's record?'" Tracy Martin told ABC News in an interview Sunday. "What about his? ... Trayvon was innocent." 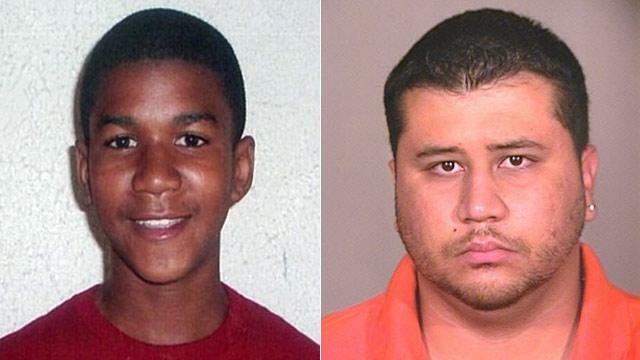 Trayvon Martin had no arrest record or disciplinary action for violence as a student in North Miami's Krop High School. On Monday, Lee, seeking to head off racial unrest, tried to reassure the public that his department was doing all it could to reach a fair conclusion, as some in the crowd heckled him by saying, "a little black boy is dead." Lee's department said it plans on passing its investigation over to the state's attorney office to determine whether to press charges against Zimmerman. Trayvon Martin's parents described him as the kind of son who, even at 17, allowed his parents to kiss him publicly. "That was my baby, my youngest son," his mother, Sybrina Fulton, told ABC News in an interview in Miami. "He meant a lot to me, I don't think the police department really understands that. ... I need justice for my family, I just want justice for my son." Fulton is incensed that Zimmerman left his car despite being urged by dispatchers to stay put. "My son didn't do anything," she said. "He was walking home from the store. Why would the neighborhood watch guy would have a weapon? ... It's just crazy. You are supposed to watch the neighborhood, not take the law into your own hands." ABC News' Matthew Rosenbaum contributed to this report.